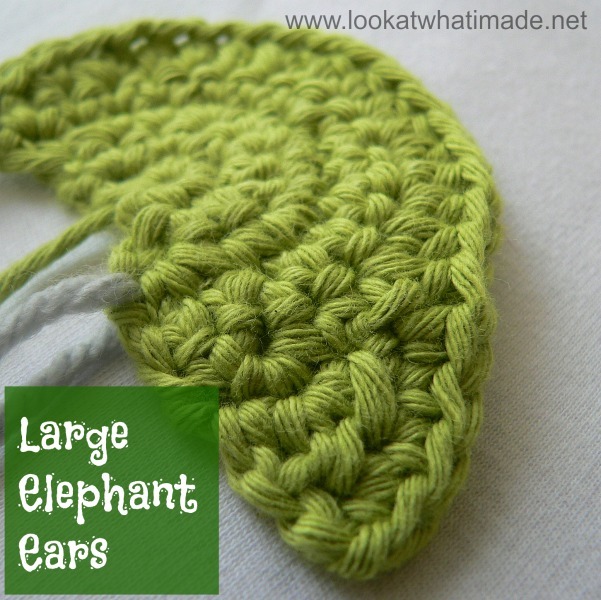 I know…a pattern for large crochet elephant ears seems very strange. These ears are meant as a substitute for the more girly ears my elephant patterns currently have. And rather than writing out the whole head again, I have decided to just post the pattern for the large ears on its own…with instructions on how to attach them, of course. Some of you might be familiar with Meimei my baby crochet elephant, Grace my crochet elephant comfort blanket and Eleanor my crochet elephant puzzle. Most of you probably aren’t. So let me enlighten you. I have devised a method for crocheting the ears onto the head as you go, negating the need for *shudder* sewing them on later on. 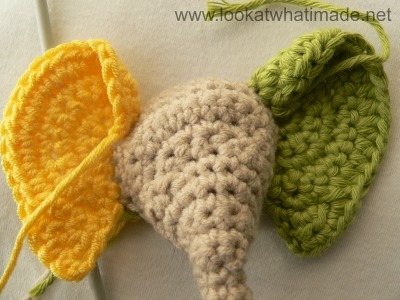 Below the pattern for the Large Crochet Elephant Ears, you will find instructions for attaching the ears in this fashion (join-as-you-go) when using them in one of my patterns instead of the regular ears. This does not, however, mean that you can’t make these ears and sew them onto any old elephant. 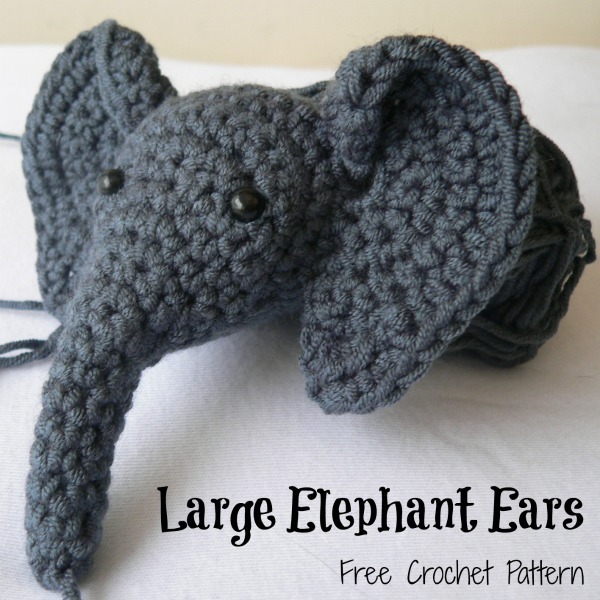 If you find another elephant pattern you really like the look of, but you would like to add these ears instead of the ones in the pattern, be my guest! If you are going to sew these ears onto an existing head, scroll up and have another look at the very first photo in the post. You should attach the ears with the fat bit of the ear to the top and folded over slightly onto itself. If you are going to attach them to one of my elephants, make an elephant head by following the instructions for the head in the pattern for Grace the Crochet Elephant Lovie (PDF Pattern) OR by following the instructions for the head in the pattern for Meimei the Crochet Baby Elephant (pattern written out on my site). Both these heads are the same, the one is just attached to a blanket and the other is attached to a body…mneh. When you get to the bit that tells you to attach the ears, use Note 1 and Note 2 below instead of the ones supplied in the original patterns. The ears are each crocheted into/onto the head over 6 stitches. This remains the same regardless of whether or not you use the original girly ears or these large crochet ears. Please Note: I made the ears in green and yellow to make it easier to see what goes where. I have also supplied stitch counts in parentheses after each step to help you keep track of the stitches. Hold the ear in front of the head and upside down, with the end tail of yarn to the left as in Photo 2 below. (If you are left-handed, remember to flip the ear so that the end tail of yarn is to your right.) You will work the 6 sc’s attaching the ear through both the head AND the ear. Photo 9 illustrates what the ear will look like from the front. You should end up with a neat little fold at the top of the ear. Hold the ear in front of the head and upside down, with the end tail of yarn to the left as in Photo 1 below. (If you are left-handed, remember to flip the ear so that your end tail of yarn is pointing to the right.) You will work the 6 sc’s attaching the ear through both the head AND the ear. If you have never made one of my elephants, you are probably sitting there going “What??? !” It really does make a lot more sense once you are doing it. If you try, and fail, please contact me so that I can walk you through it. 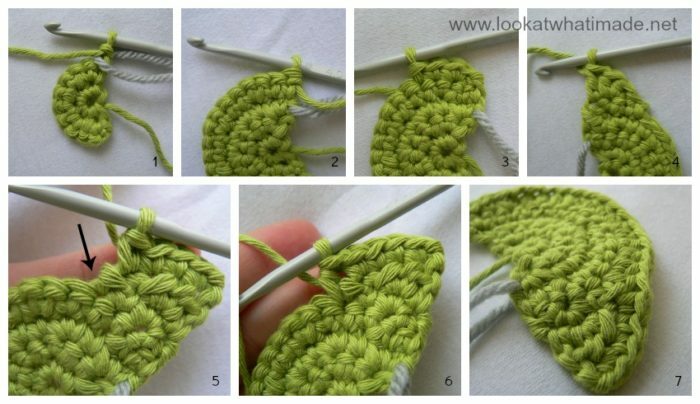 I am passionate about making things easier and although this method (join-as-you-go-crochet) seems more tricky at first glance, it is SO EASY once you get the hang of it. I hope you have fun with these Dumbo-style ears! Fabulous design, love, love, love being able to crochet the ears to the head instead of having to stitch them later! A couple questions a I finish up the head. 1. Why the chain 1 at the end of the ear, and what do I do with that tail? Thread it through the center hole of the ear and weave the ends to the back side of the head or ear? 2. Do you stuff the trunk? 3. Why the chain 1 at the end of the head and why not continue to decrease and stitch the head closed before attaching to the blanket? Thank you again for such a wonderful pattern! 1. The ch-1 creates a little knot when you pull it tight. It is just the way I like to fasten off to make sure things don’t wiggle loose. I mad sure the tails were inside the head when I crocheted them on (I just stuffed them into the head), but you can easily work them away into the head later. 2. I don’t stuff the trunk, I just push the tails into the top of it. 3. You are welcome to close the head before attaching, but if you stop where I suggest, you know exactly where to sew it onto the blanket. If you close it first, it becomes hard to know on which round of the head to attach it so that it a) doesn’t bulge and b) is secure enough. Again, the ch-1 is just a tastening-off knot.